Recent heavy rain drew me back to my syndicate water this week, after a break of nearly a month. On my last visit, the river was desperately low, but plenty of wild browns were feeding. One look at the river this time dashed any hopes of a busy session, bare stones visible, where a few months ago a wading stick was needed. The stream was carrying a fair amount of colour, as I walked downstream searching in vain for rises and visible trout. I tied on a size 18 Gold Head Pheasant Tail nymph, dropping it into known banker pools as I went. With no luck and faced with crossing a meadow full off frisky young bullocks, I opted to pass through a copse on the other side of the river. 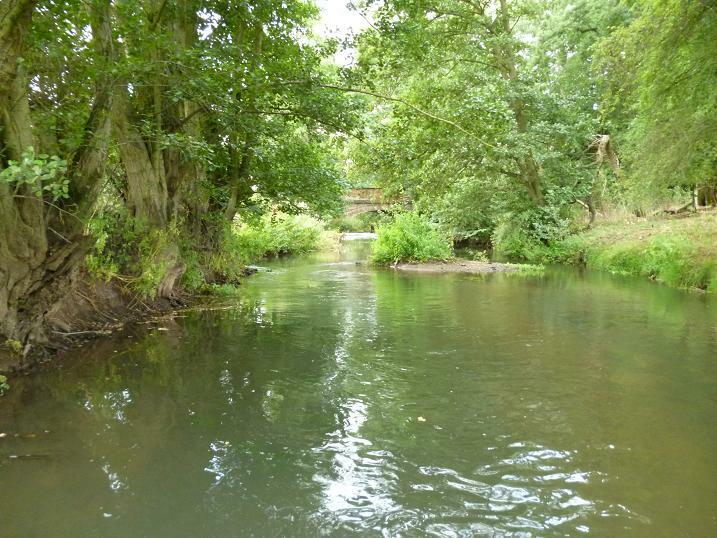 This was new territory to me, but on a recent work party we had cleared the banks of dead trees, stinging nettles and Himalayan balsam, giving access to the river. This area was also devoid of rising trout, but there was good weed growth, creating several encouraging runs through the otherwise slow moving water and all else having failed, decided that wading was now a safe option on this once deep, high banked section. Going through the motions of short casts to likely spots, then wading up a few paces and trying again, I disturbed a good fish, that made off upstream creating a V shaped wake, but could not see if it was a chub, or trout. More importantly, why had it not taken the nymph presented in front of it’s nose? I was shaken out of my gloom, when the leader darted forward and the resistance of a small wild brown was felt, fighting for all it’s seven inches could give. Another twenty yards upstream and I was in again, when a similar sized trout popped out from a weed bed and dived away with my nymph. At least these faster runs held some small, but feeding fish. Further upstream I stopped at a deep, tree covered pool, isolated by stoney shallows. 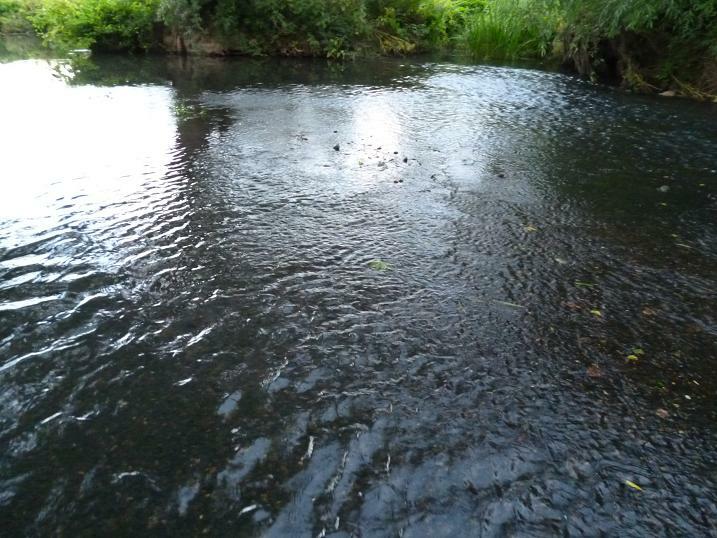 I cast to the head of the pool, where the flow passed close to the tree roots and felt the take from a trout as the line sank into the centre of a bulge beneath the surface, my nymph firmly set in the jaws of a diving wildie, that fought round the pool, before coming to the net. 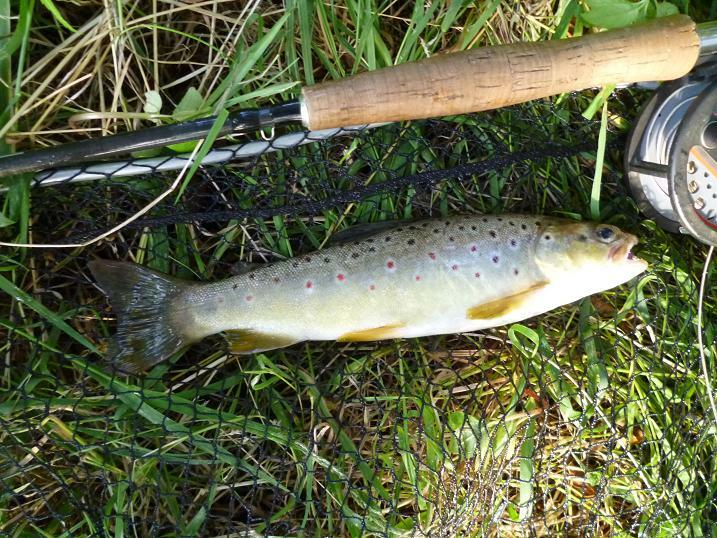 This plump brown rounded off my visit to the upper reaches of the water and with the afternoon changing to evening, I decided to return to my van and fish the river a mile downstream, where I knew of a fast flowing runoff. Earlier in the year this was too dangerous to wade, but now offered sure footing. This section looked very fishy and I was soon missing short stabbing takes, as the nymph was swept back toward me. 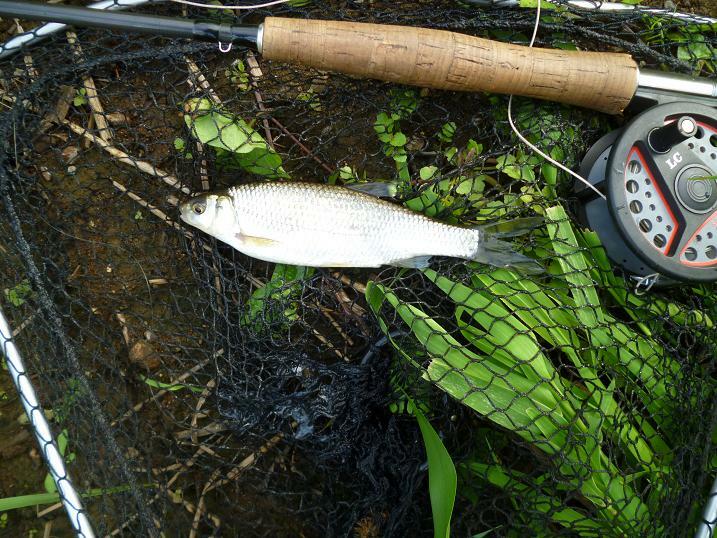 One fish hung on long enough to set the hook and a small dace was tumbling in the stream. 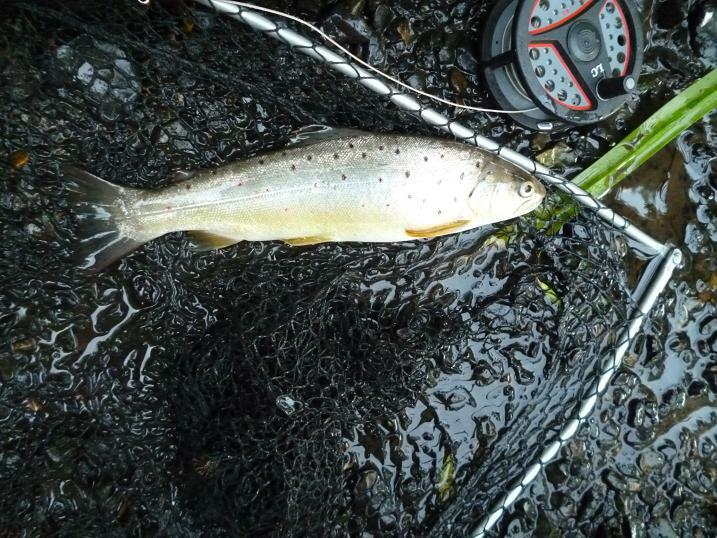 A six inch brownie followed and as I moved up to the bend, some better dace. This was addictive, these silver fish just plucking at the nymph, sometimes chasing it downstream. 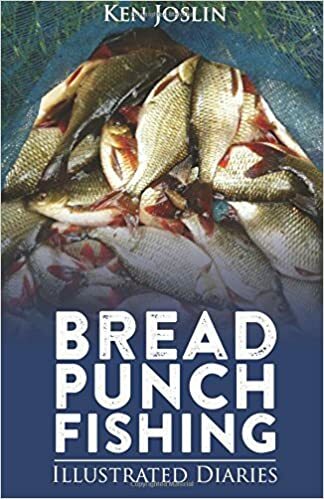 I lost count of the number hooked and returned at my feet, the larger fish dropping down the run, putting a bend in the rod. 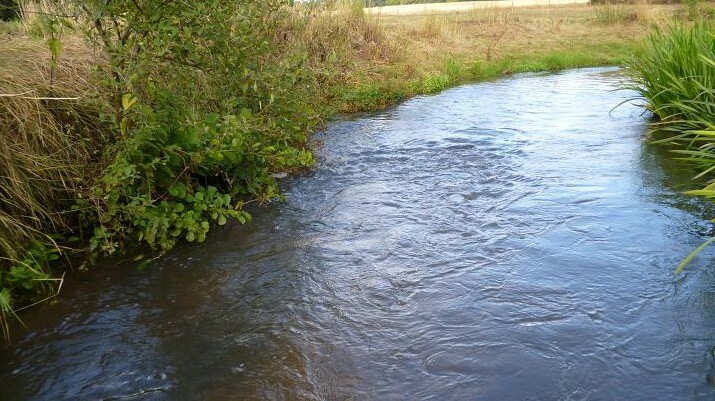 I’d worked my way up to the tail of the large pool above and began dropping the nymph into the slower water, another dace, then a swirl indicated the take of a trout, which exploded out of the shallows, cartwheeling across the pool, before seeking deeper water. This was a pound plus wild brown, but fighting the flow and the rod it was soon drifting back toward my net, only to bounce off the tiny barbless hook as it crossed the stones. How annoying! Casting further up I missed another trout, probably down to the quick reactions needed for dace, it was on long enough to see the spots, then it was gone. 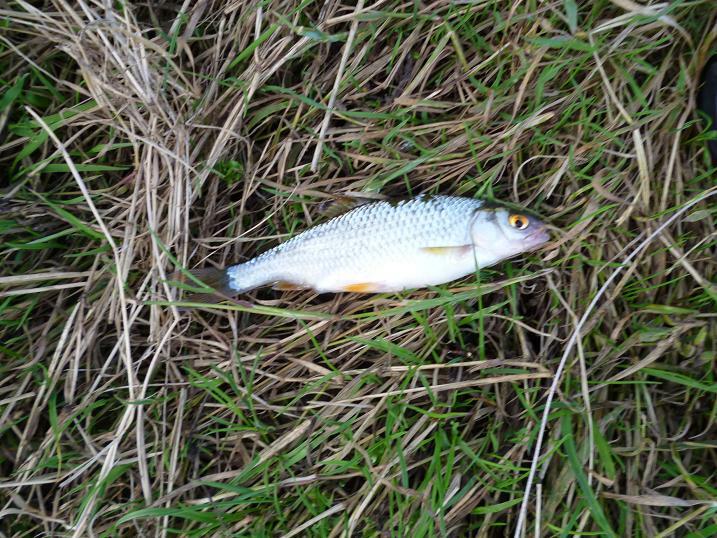 My last fish from the pool took in the shallows and was a rare roach. 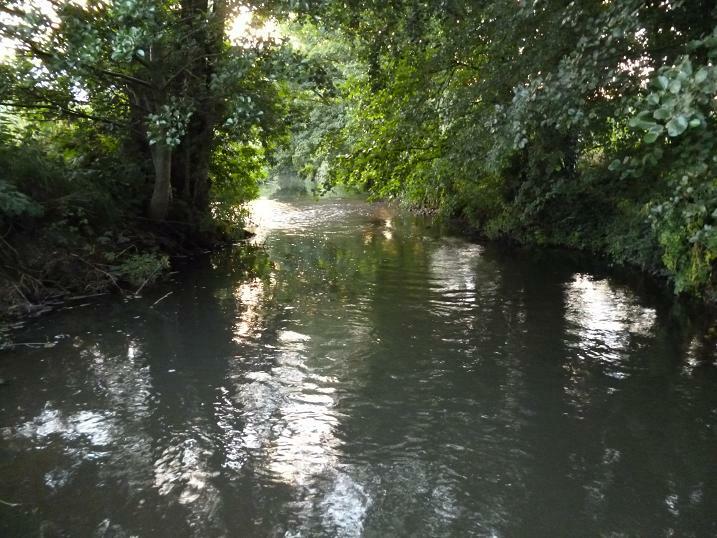 I was now late for my tea and made my way back to the road, but stopped to fish another pool, where I could now wade due to the low levels. This had been a favourite in past years, but winter floods had deposited deep mud at the edge and I’d been passing it by, now it was possible to wade. 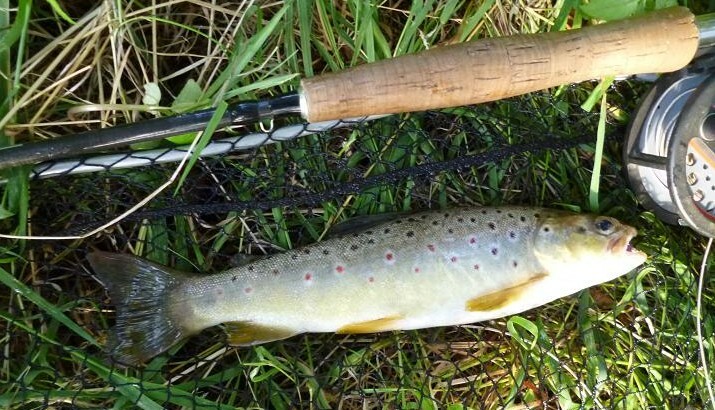 With no sign of rising trout, the nymph was prospected around the pool, bumping a fish on the take under the trees, before another obliged with a long pull of the leader in the run and a scrapping ten inch brown was soon in the net. This lively trout was enough for me and I headed home, no rising fish to be seen, or larger browns netted, but plenty of small fish action and my dinner waiting on the table. 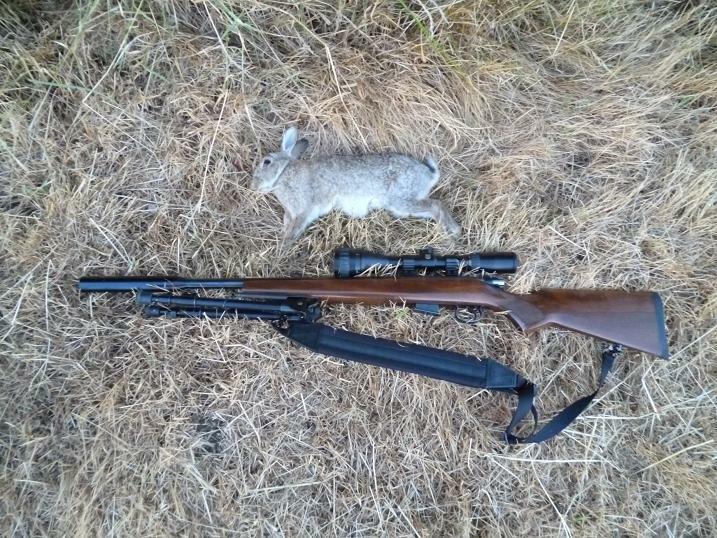 CZ 452 HMR takes over from the Webley Viper for long range rabbits. 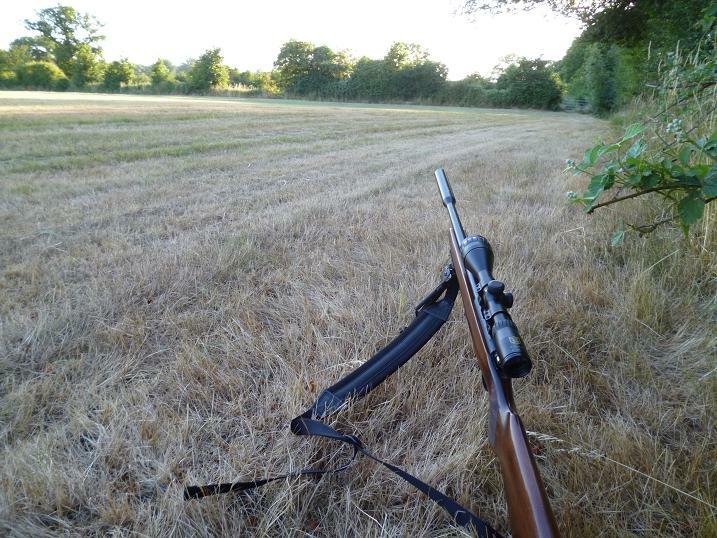 Driving past one of my shooting permissions, I saw that the hay had been gathered in and with their cover gone, a group of rabbits were feeding unaware of my plans for them over the following evenings. Unable to get on the land earlier in the year, then hampered by long grass, as the summer progressed, I’d been biding my time, until now. The land is owned by a Knight of the Realm and acts as a buffer around his fine country house and garden. Over the years he has planted trees on the land to create a mini parkland, the only activity being haymaking by a farming neighbour. Around the extensive perimeter, he had erected a rabbit and deer proof fence, not realizing that rabbits love to burrow and that deer can easily jump their own height. This was one of my first permissions, when I was asked to come and shoot the rabbits, that had invaded the owner’s lawns and surrounding flower beds. In those days my weapon of choice was a Webley Viper .22 precharged air rifle, this being the ideal tool for the work. 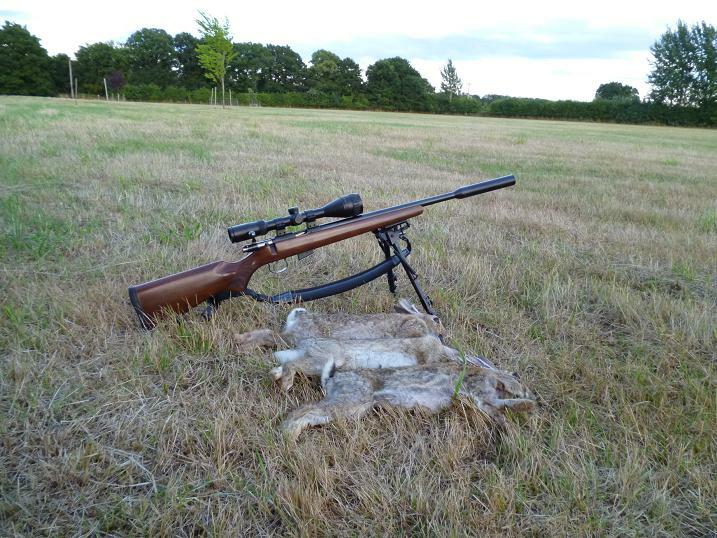 At the legal limit of 12 ft lb and very accurate, most shots were taken out to 25 yards with decimating results on the furry intruders, each visit on my way home from work, supplying my local butcher with head shot rabbits. 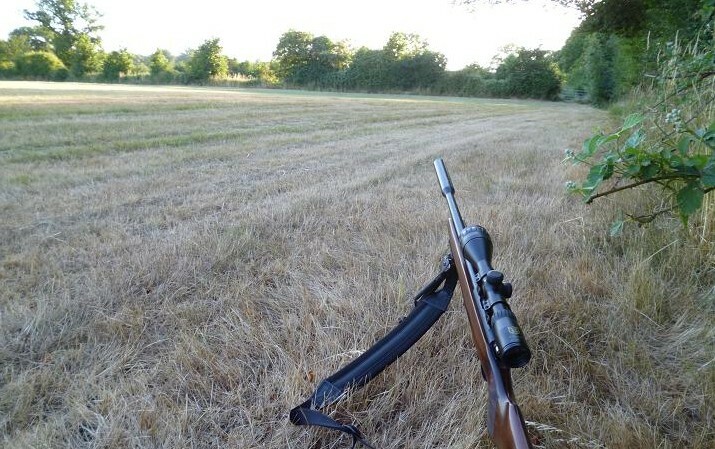 Once the garden was cleared, a warren close to the rear fence became my target, a cammo net pegged permanently at the corner of a hedge, gave me sight over the entrances 30 yards away and having made an adaptor to take a small light weight moderator, which fitted to the end of the Viper’s silencing shroud of the Walther barrel, I was able to pop off rabbits 10 yards away without causing panic among the masses. This was when I first observed that rabbits will go on feeding, while those around are flopping over under the weight of a .22 pellet in the brain. At this time I had to find another butcher, as my first had equaled his demand. I was fortunate to buy this rifle, when Webley went into liquidation and bought it at a price, which effectively gave me a free diver’s bottle for filling the reservoir, a scope and a gun case. A bargain, which I soon paid for from my evening visits. The land beyond the house stretches to about ten acres and is lined with hedges, but due to the anti rabbit mesh, gives little cover and after the first year of shooting, the remaining rabbits became educated to the fact that this cammo clad figure, belly crawling towards them, spelt danger and the loss of friends. With several permissions by now , I applied for my Firearms Certificate and was granted .22 lr and .17 HMR. 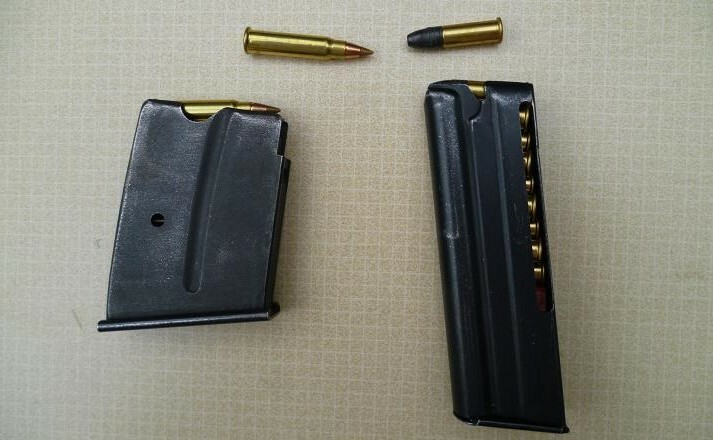 Priced at only £100, I purchased a .22 Magtech semi automatic rifle and three ten round magazines. Armed with this, fitted with a moderator and firing 40 grain subsonic .22 hollow point bullets, I was back in business, taking on rabbits at 60 yards with the confidence I once associated with the Webley Viper at 25 yards. The heavy expanding bullet hitting with a boof, with another nine shots to rapidly follow up on any others hanging around. The Magtech semi auto served me well for another season and firing Eley subsonic ammunition, proved totally reliable. Once the trajectory of it’s bullet was understood, 80 to 90 yard shots were possible, but by now the few remaining rabbits were getting scarce, with returns from visits deminishing, as the residents headed for their burrows, when I tried to get within range. This was the case on some of my other wide open permissions and it was time to take up the option on my FAC and buy an HMR. 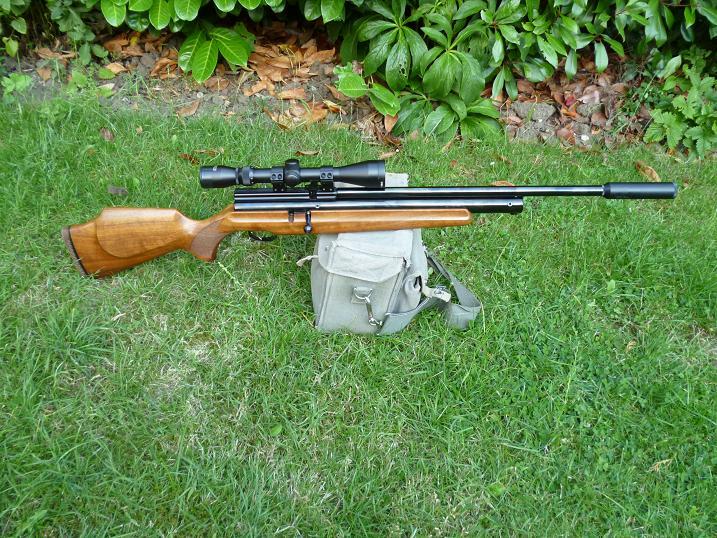 Searching the Internet for reviews of HMR rifles, pointed to the CZ 452 Varmint with a 16 inch barrel, as accurate and well built, while for me, good value for money, my hobby needing to be self supporting. Sure there were known problems, a stiff trigger pull and touching woodwork around the barrel, but these were soon fixed, after a few hours in my workshop. The HMR fires it’s .17 inch diameter ballistic bullet twice as fast as the .22 subsonic round, spins faster and weighs only 17 grains, so does not drop so rapidly, carrying it’s energy further. Firing at a target set at 60 yards, the bullet rises less than an inch, before dropping and hitting the bull at 120 yards. Without adjusting the sights, or hold over, any rabbit in the crosshairs out to 130 yards is literally dead meat. 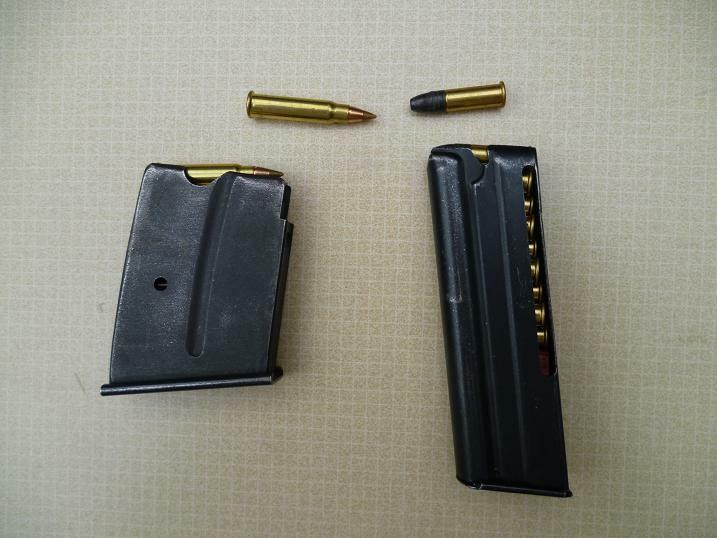 The HMR bullet on the left has a plastic ballistic tip held in a copper jacket, which disintegrates on impact, while the hollow point lead .22 bullet on the right expands on impact. 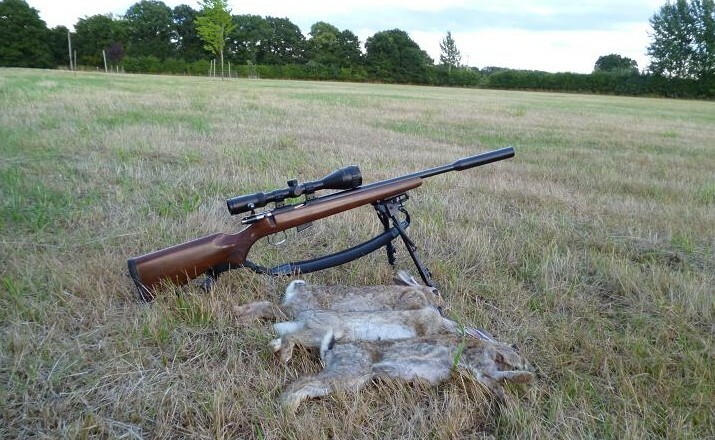 The HMR rifle promoted the pest control on this land to a higher level again and rabbit numbers dropped to them being almost invisible, once roaming free, they now stay close to their burrows, their white tails flashing back to cover at the sight of a human. Seeing the grass was now cut, I’d phoned the owner, who welcomed me, saying that there were no rabbits left, I’d shot them all. I assured him that I’d seen some and drove the few miles to prove him wrong. 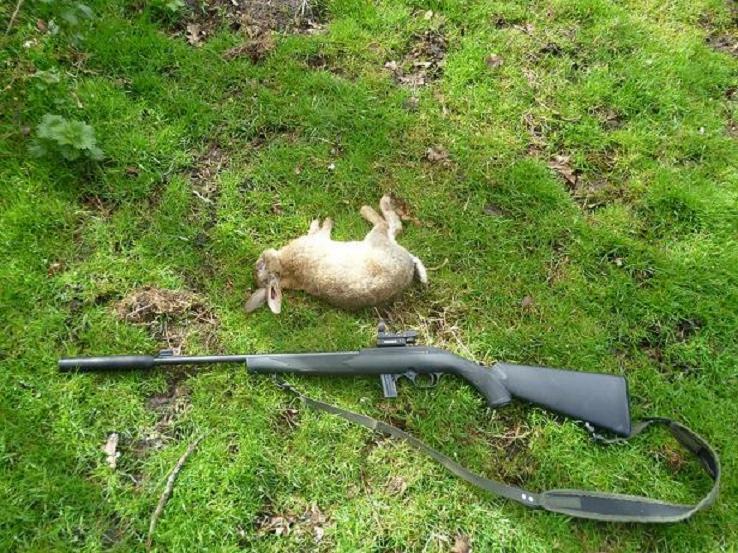 On entering the field, I could see this rabbit feeding 200 yards away and used the hedge as cover to get closer, before getting down and shooting from the bipod, a single shot to the head toppling it without a kick. I needed 140 paces to reach the spot, a point where the full extent of the land is visible, from where, using the twelve magnification scope, I was able to count over a dozen rabbits dotted around the perimeter. So much for there being none left. They were certainly edgy and several melted away, before I was in position, ending with a tally of five on the first evening, all shot at ranges beyond 120 yards. A couple more trips and the number was up to eleven, a few more, then I’ll move on, until the autumn.